Joe Biden rumblings: Rumors say Schrodinger's vice president might be running or not running. 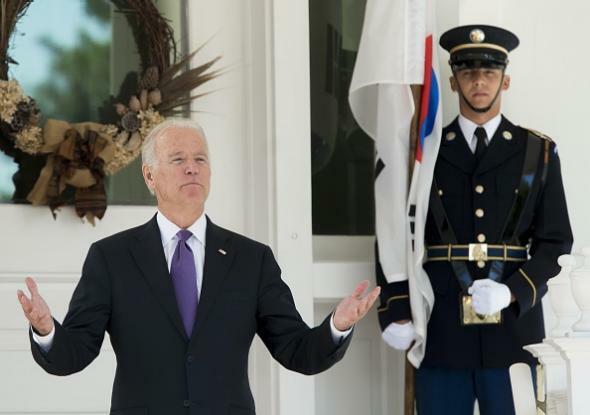 Joe Biden demurs as reporters shout questions about his potential presidential campaign plans as he awaits the arrival of South Korea’s president at the Naval Observatory in Washington, D.C. on Oct. 15. Earlier today the streets and hallways of Washington, D.C. were abuzz with rumors, innuendo, and capital-R Rumblings indicating that vice president Joe “Smokin’ Joe Biden” Biden was on the verge of officially joining the 2016 presidential campaign. Was it true? Was it really “Joe time,” which is like “go time”? Not so fast, other reporters said. The source says no decision is coming today -- and that Biden is genuinely undecided. No timeline for a decision but "time is nigh"
Who can say? In the end, the only thing we truly know is that major celebrities such as Beyoncé and LeBron James were likely apprised of Biden’s intentions at a secret meeting months ago. I wish they would tell us what he’s gonna do!